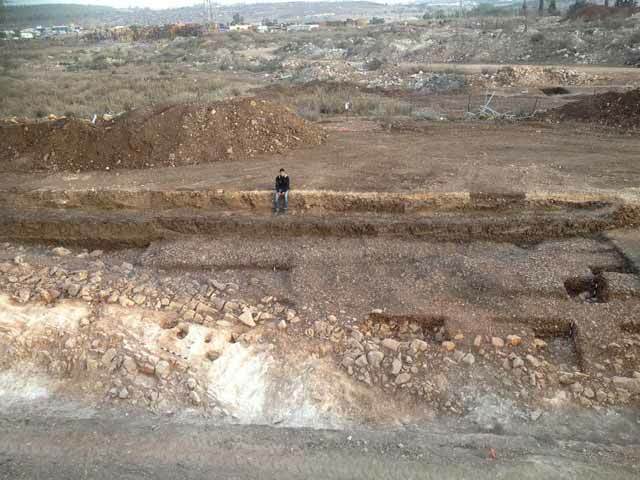 In September–December 2013, a trial excavation was conducted on the hill of Giv‘at Rabbi and to its east (Permit No. A-6905; map ref. 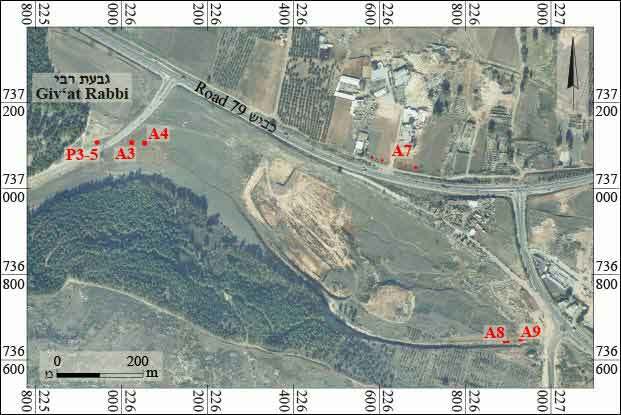 225446–7063/736500–7573), prior to widening Highway 79 and developing the junction at the entrance to Nazareth and the city’s industrial area. 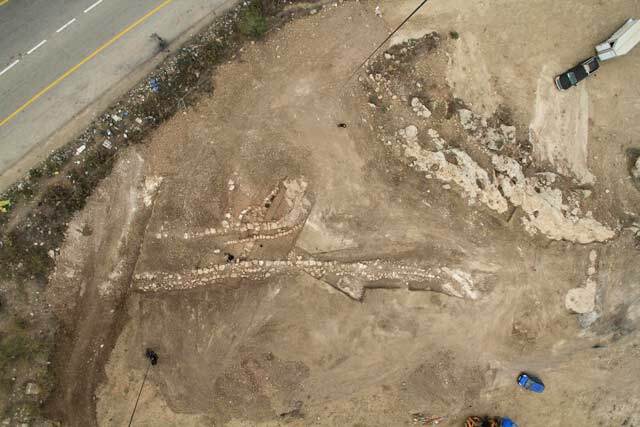 The excavation, on behalf of the Israel Antiquities Authority, was directed by A. Yaroshevich (field and studio photography), with the assistance of M. Shemer, F. Abu Zidan, Y. Gur and R. Liran (area supervision), W. Atrash and Z. Horowitz (consultation), Y. Ya‘aqobi and Y. Lavan (administration), R. Mishayev and M. Cohen (surveying and drafting), Y. Bibas (field photography) and F. Fartush of Skyview Company (aerial photography). Y. Gur performed a preliminary survey of the area. Four excavation areas (A3–4, A7, A8–9, P3–5; Fig. 1) were opened along the eastern slope of Giv‘at Rabbi and in the valley that extends to the east. 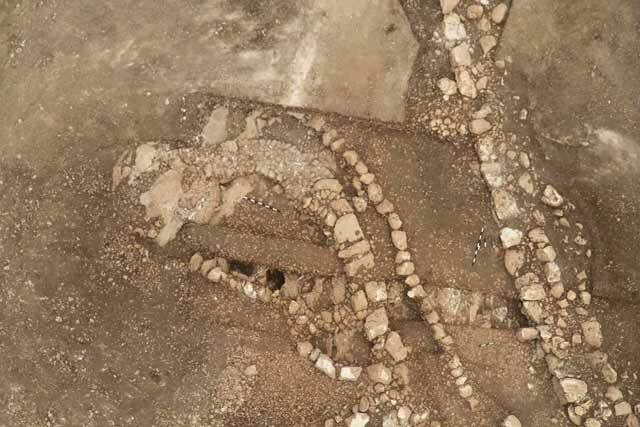 The location of the areas was determined based on the findings of a preliminary survey and artifacts discovered in trial trenches that were dug in advance of the excavation. 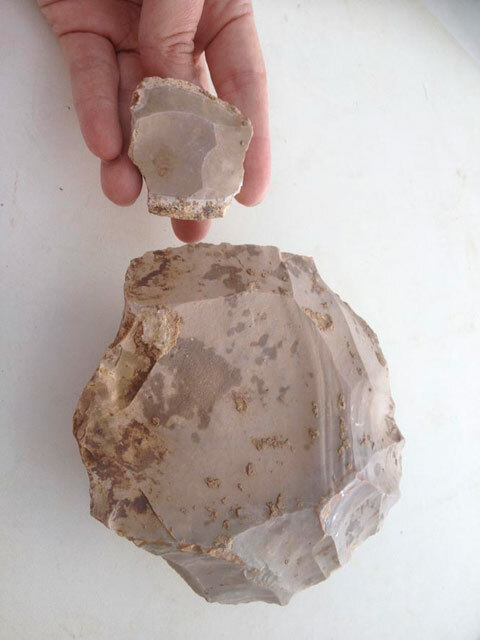 The main finds from the excavation consisted of two knapping sites, one from the Middle Paleolithic period, the other from either the Neolithic or the Chalcolithic period, and settlement remains that could not be dated with certainty. 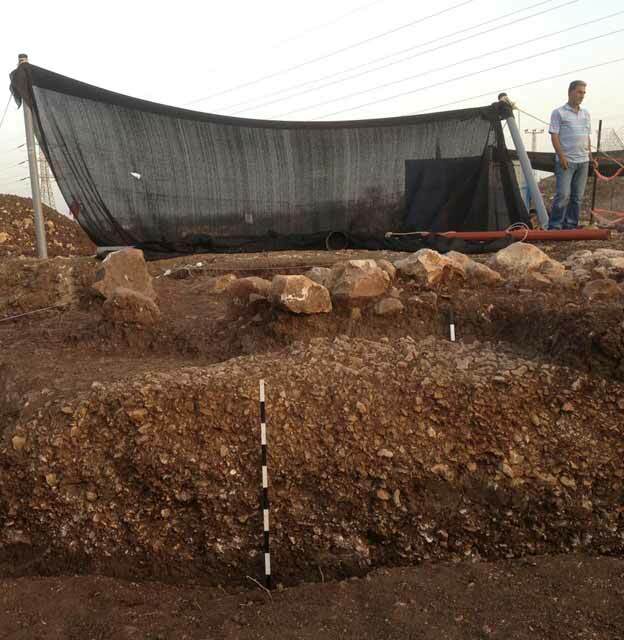 Additional excavations conducted in the nearby area uncovered remains that date from the Middle Paleolithic, Pre-Pottery Neolithic B and C, Early and Late Chalcolithic, Early Bronze IB and II, Intermediate and Middle Bronze, Roman, Byzantine and Crusader periods (Barzilai and Milevski 2010; Ekshtain et al. 2012; Barzilai et al. 2013; Milevski and Getzov 2014; Yaroshevich 2016; Y. Vardi, pers. comm.). Area A3–4. 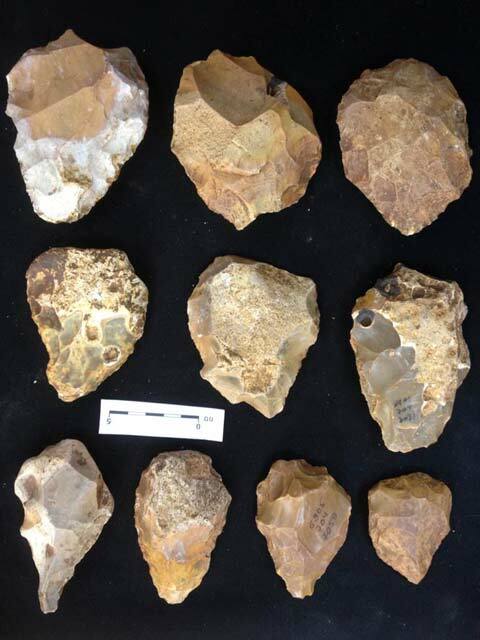 Sixteen excavation squares were opened, yielding flint items from the Middle Paleolithic period (Mousterian culture) and flint tools, including axes and adzes, from either the Neolithic or the Chalcolithic period. The items attributed to the Mousterian culture were abraded and covered with patination, and were discovered mainly in the northern part of the area, near the outlet of a man-made channel that leads into nearby Nahal ‘Illut. 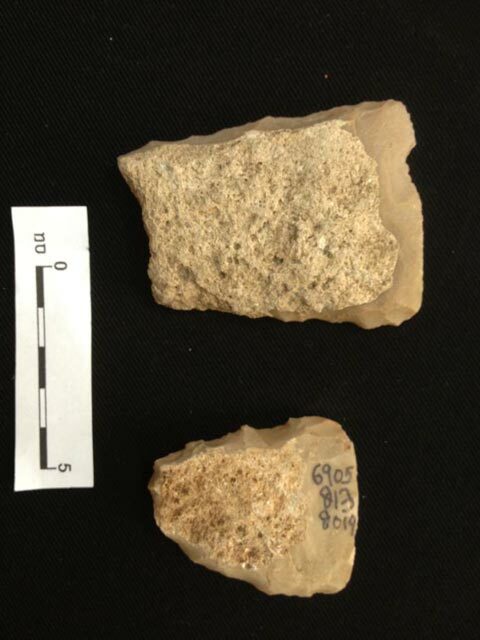 These items were evidently swept down the stream from a knapping site located in Area A8–9 (below). The tools which can be dated to either the Neolithic or the Chalcolithic period were discovered mainly in the western part of the area; it seems that they originated in nearby Area P3–5 (below). Area A7. Five excavation squares were opened. 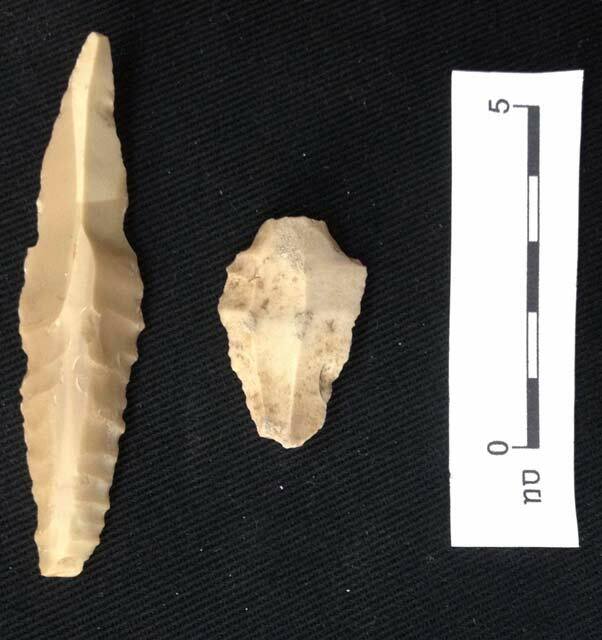 The two western squares yielded a habitation layer with fresh, sharp flint items, including knapping debitage and bifacial tools in various stages of preparation, from either the Neolithic or the Chalcolithic period (Figs. 2–4). 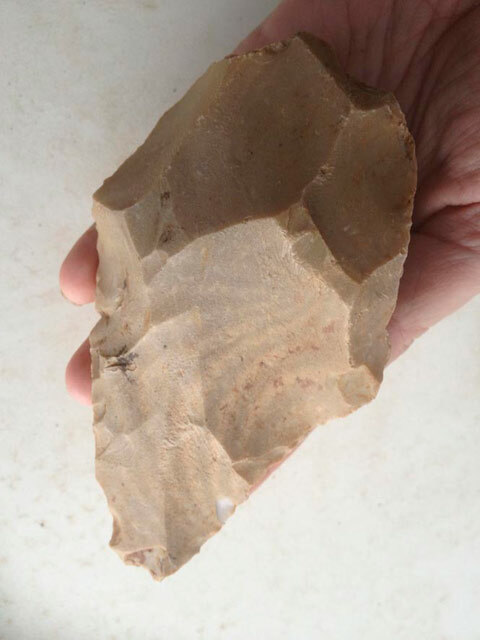 Debitage from the production of bifacial tools in either the Neolithic or the Chalcolithic period was exposed in the easternmost square. 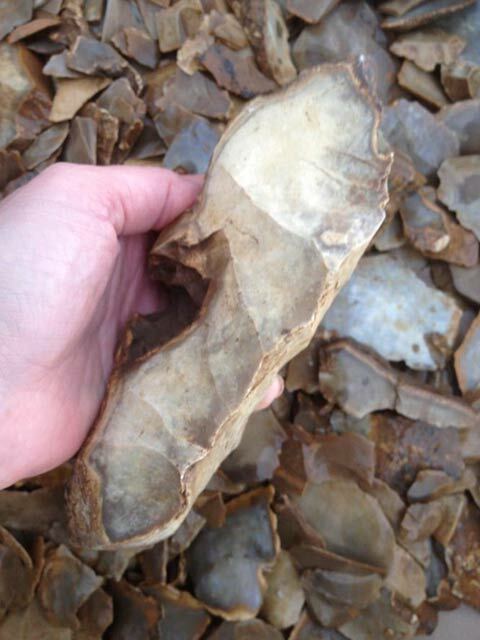 It probably originated in a knapping pit dug into a layer of alluvium. Abraded flint items bearing patination, including numerous handaxes (Fig. 5) and several Levallois items, were discovered in the alluvium. Numerous handaxes were exposed in the rest of the squares (Fig. 6) alongside a few Levallois items, all of which were worn and covered with patination. Area A8–9 (c. 250 sq m) was situated in the artificial channel that ran west, into Nahal ‘Illut. The site was discovered when the artificial channel was constructed; unfortunately, this activity damaged other ancient remains as well. A habitation level with knapped flint items and several cupmarks of various sizes hewn in the soft chalk bedrock was unearthed (Figs. 7, 8). The cupmarks may have been hewn in an attempt to extract flint nodules. In the east part of the area, above the layer of flint items, was a concentration of large fieldstones, probably the remains of a later agricultural terrace (Fig. 9). The flint assemblage comprised mostly debitage and several tools. Many items were produced using the Levallois technique (Fig. 10); these date the assemblage to the Middle Paleolithic period (Mousterian culture). Several handaxes (Fig. 11) that are generally attributed to the Lower Paleolithic period (Acheulean culture) were also among the discoveries in the assemblage. The hand axes may have been used for extracting raw material (Barkai, Gopher and La Porta 2002). Most of the items bear slight signs of wear and patination, but some are fresh and sharp. Area P3–5 (Fig. 12). 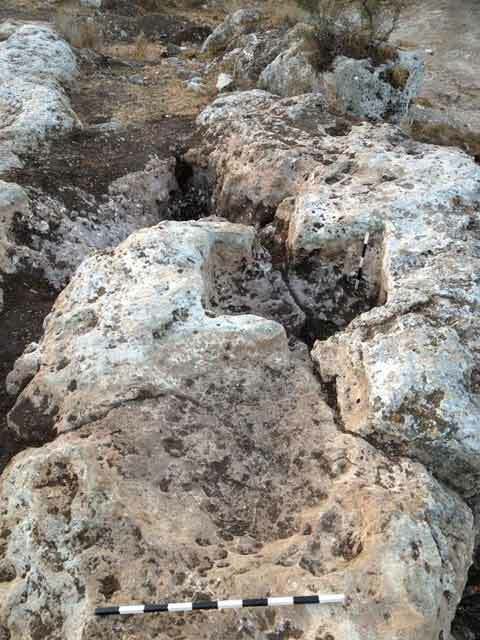 Two rock-hewn wine presses and construction remains were unearthed on the eastern slope of Giv‘at Rabbi; the building remains sustained severe damage when a road was paved there. One of the wine presses consisted of a rectangular treading floor and a cupmark-like collecting vat (Fig. 13). The other winepress had a circular treading floor and a collecting vat which was clearly enlarged at some point (Fig. 14). The architectural remains included an elliptical structure and an adjacent long, massive wall, both aligned in a northeast–southwest direction (Fig. 15). The massive wall was constructed mainly of field stones, with incorporated hewn stones. The structure was founded on the bedrock and partition walls were built inside it. A surface of tamped earth and small stones, probably a courtyard or a street, was exposed east of the structure. The massive wall postdated the layer of soil and stones, and it is unclear whether it was contemporaneous with the structure; if the two were in use together, the wall may have served to protect the building. 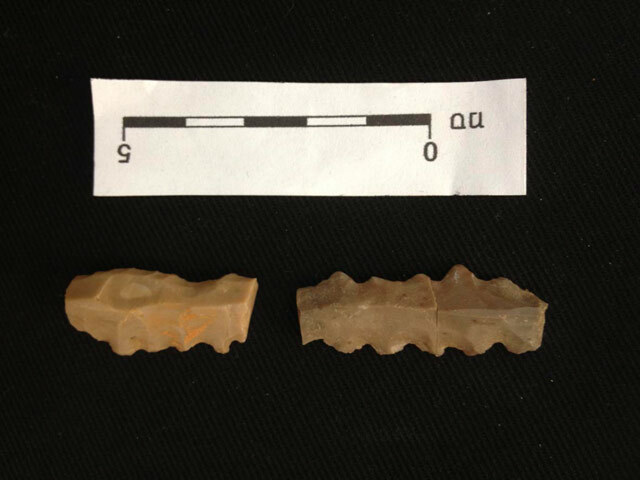 The excavation of these building remains yielded PPN ‘Amuq-type arrowheads (Fig. 16), PN denticulated sickle blades (Fig. 17), as well as adzes (Fig. 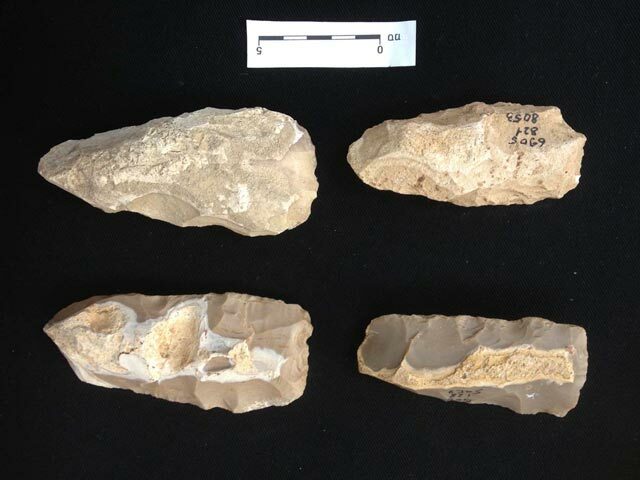 18) and bifacial tools that were knapped on tabular flint (Fig. 19) from the Early Chalcolithic period. In addition, sparse ceramic finds, dating to the Roman and Byzantine periods, and several basalt vessels and other stones artifacts, including sling stones, were found. 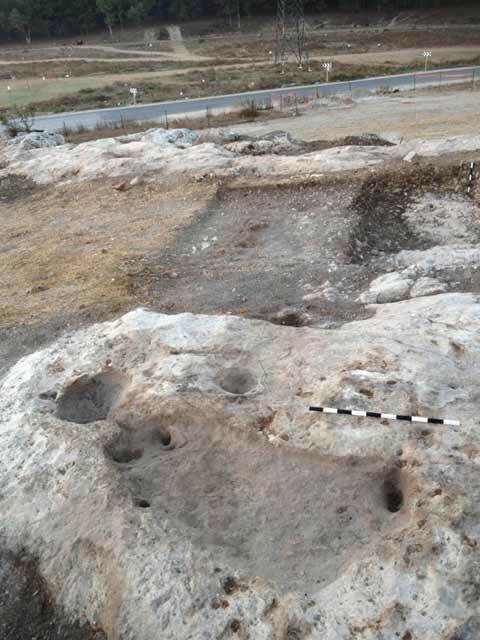 Two knapping sites, one from the Middle Paleolithic period (Mousterian culture) and the other from either the Neolithic or the Chalcolithic period, in addition to ancient settlement remains, were discovered in the excavation. It is plausible that the Middle Paleolithic-period knapping site was used by the inhabitants of Qafzeh Cave, located c. 7 km east of the site. 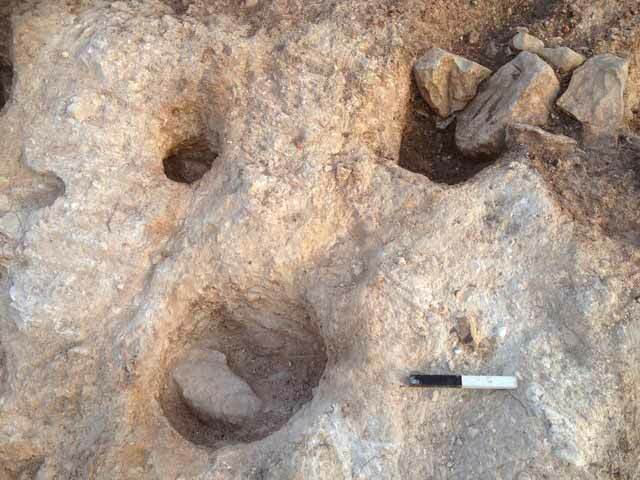 The knapping site from the Neolithic or Chalcolithic periods may be related to the nearby site of ‘En Zippori, where settlement remains from the Pre-Pottery Neolithic B and C and the Early and Late Chalcolithic periods were revealed. As no evidence of the naviform technology, which is characteristic of the Pre-Pottery Neolithic B, was found at the knapping site, it is more probable that the site dates from the Chalcolithic period. The settlement remains include a building and two winepresses, and it seems that they too were associated with the ‘En Zippori site. 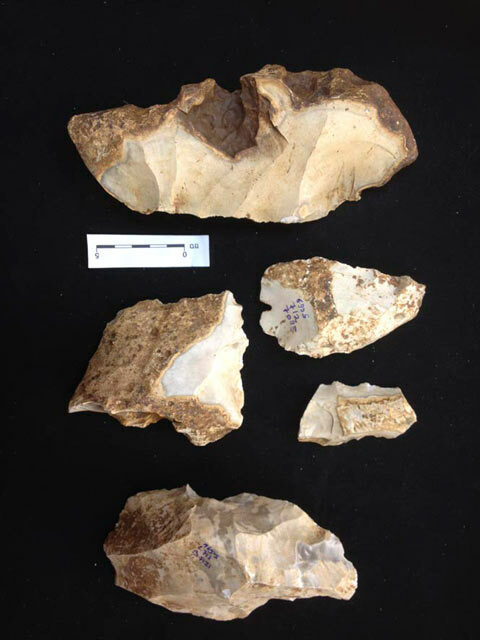 The date of the settlement is unclear because the flint artifacts related to it date from several periods, and no ceramic finds were discovered. Barzilai O. and Milevski I. 2010. Giv‘at Rabbi (East). HA-ESI 122. Barzilai O., Getzov N., Gubenko N., Marom M., Milevski I., Vered A. and Zheng J. 2013. Proto-Historic Ein Zippori: The 2007 Excavation Season. JIPS 43:22–72. Barkai R., Gopher A. and La Porta P.C. 2002. 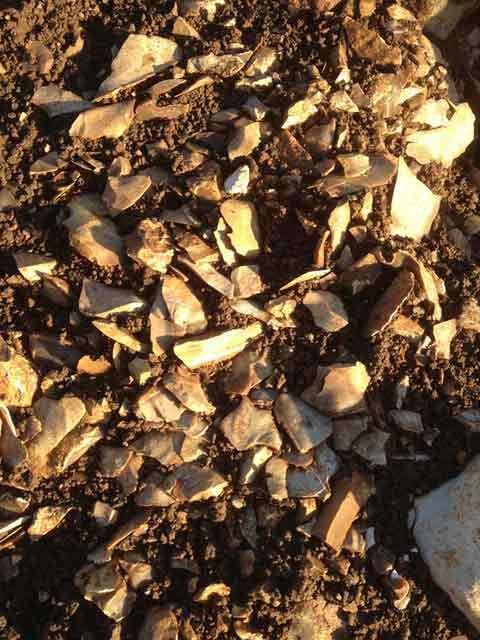 Paleolithic Landscape of Extraction: Flint Surface Quarries and Workshops at Mt. Pua, Israel. Antiquity 76:672–680. Milevski I. and Getzov N. 2014. ‘En Zippori. HA-ESI 126. Yaroshevich A. 2016. ‘En Zippori. HA-ESI 128. 3. Bifacial tool in an initial knapping stage. 4. Bifacial tools in various stages of preparation. 5. 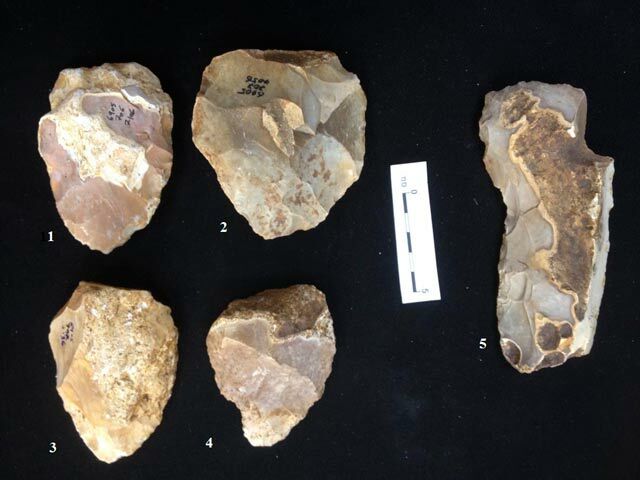 Handaxes (1–4) from the Lower Palaeolithic period and a bifacial tool (5) from either the Neolithic or the Chalcolithic period. 7. Area A8–9, a layer of flint items and cupmarks, looking north. 8. Area A8–9, rock-hewn cupmarks, looking east. 9. Area A8–9, fieldstones above a layer of flint items, looking north. 10. Cores produced using the Levallois technique. 12. Area P3–5, aerial view to looking south. 13. A rock-hewn winepress, looking south. 14. A rock-hewn winepress, looking east. 15. An elliptical structure, looking west. 16. ‘Amuq-type arrowheads from the Pre-Pottery Neolithic period. 17. Denticulated sickle blades from the Pottery Neolithic period. 18. Adzes from the Early Chalcolithic period. 19. Bifacial tools from the Early Chalcolithic period.